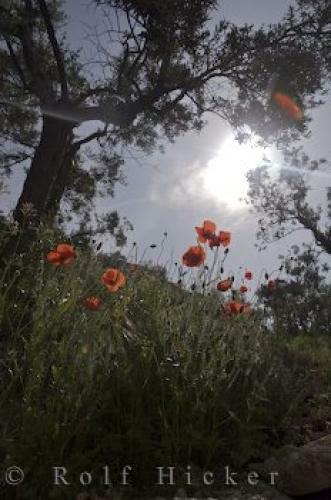 Wildflowers and poppies grow amongst terraces of Olive trees in a village in Provence, France as the sunlight breaks through the darkening clouds. Dark clouds threaten the village of Moustiers Ste Marie in Provence, France as they hang above the olive trees leaving only a small opening for the sunlight to break through. There is enough light for the poppies and wildflowers to dance about the landscape as the rays seem to shine directly on them before the rain moves in. wildflowers and poppies amongst terraces of Olive trees in the village of Moustiers Ste Marie, Alpes de Haute, Provence, France, Europe. Olive trees in a village in Provence, France.